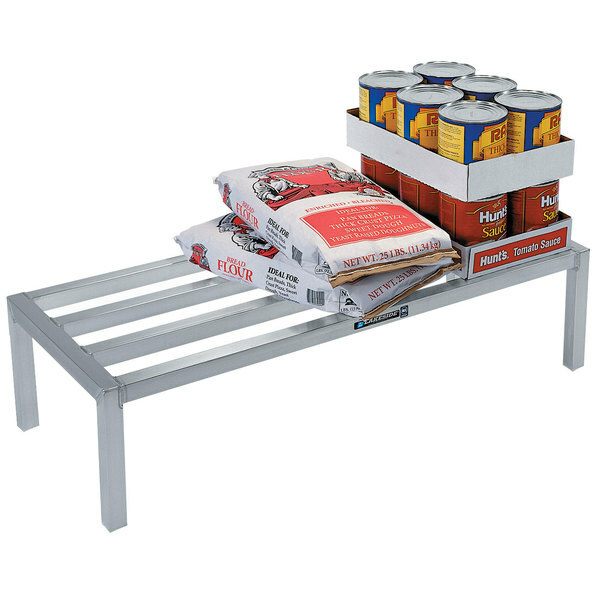 Ensure safe storage of bulk food items while still keeping them within easy reach with this Lakeside 9172 aluminum dunnage rack! This rack is made of durable, all-welded, tubular aluminum for outstanding strength and durability. It can support up to 1500 lb. of evenly distributed weight, making it the perfect choice for large boxes of produce, unopened sacks of dry goods, and more. This aluminum dunnage rack is comprised of 1 1/2" x 1 1/2" extruded aluminum alloy tubes for lightweight durability. Light enough that you can move it around your storage room or cooler easily yet durable enough to support your heaviest bulk items, this rack is ideal for a variety of applications. Its 8" height makes it the perfect choice for storing food items since it complies with FDA food storage codes. Plus, the legs are capped with plastic feet to prevent contamination while protecting your floors from damage.